The seven men and five women comprise the 22nd class of American spaceflight trainees since 1959. This is the largest group Nasa has selected in almost two decades. 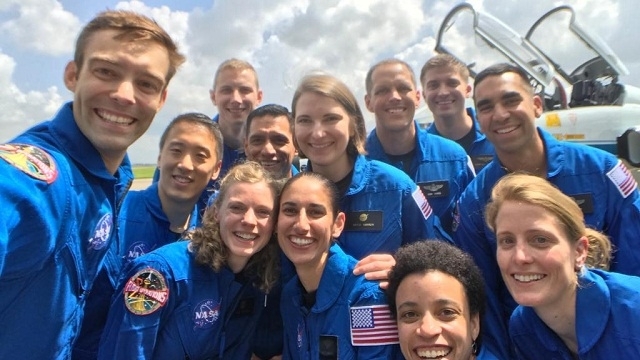 HOUSTON: American space agency Nasa has chosen 12 new astronauts, including an Indian-American, from a record number of over 18,000 applicants, who will be trained for missions into Earth orbit and to deep space. It was selected from a record 18,300 applicants - more than Nasa has ever had during an open astronaut call. To get picked, people had to meet some physical requirements as well as certain education and experience criteria - such as having a bachelor's degree in a STEM field or accumulating up to 1,000 hours of piloting jets. US Vice President Mike Pence joined NASA leaders, including acting administrator Robert Lightfoot and director of flight operations Brian Kelly, in Houston, Texas to announce the new astronaut candidates, or "ascans". Pence said that President Donald Trump is "firmly committed" to NASA's mission in space and that "America will lead the way in space once again". He also mentioned that NASA would continue to collaborate with the commercial space industry in the future. While delivering the speech, Pence touted the merits of the new astronaut class. "The courage of these men and women, and all the astronauts who have gone before, inspires me to this very day," he said. Lt Col Raja "Grinder" Chari, 39, is a commander of the 461st Flight Test Squadron and the director of the F-35 Integrated Test Force at Edwards Air Force Base in California. Hailing from Waterloo, Iowa, Chari earned a Master's degree in aeronautics and astronautics from MIT and graduated from the US Naval Test Pilot School. His father is from India. Chari has been selected by the NASA to join the 2017 Astronaut Candidate Class. He will report for duty in August. The Iowa native graduated from the U.S. Air Force Academy in 1999 with Bachelor's degrees in Astronautical Engineering and Engineering Science. He continued on to earn a Master's degree in Aeronautics and Astronautics from Massachusetts Institute of Technology and graduated from the U.S. Naval Test Pilot School. Chari will report for duty in August to begin his two years of training as an Astronaut Candidate. Upon completion, he will be assigned technical duties in the Astronaut Office while he awaits a flight assignment. After the two-year training, the new astronaut candidates could be assigned to missions performing research on the International Space Station (ISS), launching from American soil on spacecraft built by commercial companies, and flying on deep space missions on NASA's new Orion spacecraft and Space Launch System rocket.